In a case that could offer relief to thousands of student debtors across the country, Jones Swanson has joined with five other law firms to file a nationwide class action lawsuit against America’s biggest student loan servicer, Navient. The suit, Evan Brian Crocker et al. v. Navient Solutions, LLC and Navient Credit Finance Corporation, alleges that Navient has “engaged in a massive effort to defraud student debtors” across the country by misrepresenting whether their loans can be “discharged,” or erased, in bankruptcy. Jones Swanson’s co-counsel in the case are New Orleans-based Fishman Haygood, as well as New York-based Austin Smith, Chicago-based Joshua Kons, Houston-based Adam Corral and Houston-based Marc Myers. On May 11, the firms were appointed interim class counsel and interim lead counsel for absent class members. The New York-based firm Boies Schiller Flexner is also co-counsel on behalf of the proposed class in the case. Click here to see a timeline of key documents pertaining to the Navient class action lawsuit. Two sections of the US Bankruptcy Code are at the heart of the case. In 1978, Congress enacted section 523(a)(8) of the Bankruptcy Code to prohibit most student loan holders from erasing their federal student loans in bankruptcy proceedings. The students must be attending Title IV-accredited schools. The loans must be made for tuition, room, board and educational materials. However, as Jones Swanson and its co-counsel have argued, Navient often ignores these criteria, and tells student borrowers that they cannot legally erase their student debt in bankruptcy, even when they can. Thus, the firms allege, all across the country, thousands of student debtors who have already declared bankruptcy are paying back student loans that they might have erased in court if Navient had not misled them about the law. These are the student borrowers that Jones Swanson and co-counsel represent in their putative class action suit. If the suit prevails, these borrowers will not have to pay back some or all of their student loan debts. In some cases, they may even get back money from Navient. Navient was created in 2014, when the nation’s largest provider of student loans, Sallie Mae, split into two entities. One entity, still known as Sallie Mae, now functions mainly as a bank that offers private educational loans and other financial products to college students and their families. The other entity, Navient, focuses on servicing student loans, both federal and private. It also securitizes its loans—packaging them and selling them to investors—in the same way that banks have securitized home mortgages. Today, Navient collects payments for more than $300 billion worth of student loans from about 12 million current and former students—more than one out of every four student borrowers across the country. In May 2014, the US Department of Justice ordered Navient and Sallie Mae to pay more than $96 million in fines for using “unfair and deceptive practices” to charge active-duty service members unlawfully high interest rates. In December 2015, Navient lost access to billions of dollars’ worth of low-interest credit after the Consumer Financial Protection Bureau (CFPB) and Senator Elizabeth Warren drew attention to the fact that Navient and Sallie Mae had been taking out loans from the Federal Home Loan Bank of Des Moines at 0.23% interest, but lending to students at a rate 25 to 40 times higher than that. But it was in January 2017 that Navient faced the most serious allegations, in lawsuits brought against it simultaneously by the State of Illinois, the State of Washington, and the CFPB. The Illinois and Washington lawsuits claim that Navient’s predecessor, Sallie Mae, peddled to students “predatory loans” that were “designed to fail.” They also allege that Navient used “unfair or deceptive practices” to make those loans more difficult for student borrowers to pay off. Navient’s blunt response to these allegations surprised even its critics. The putative class action case brought by Jones Swanson and co-counsel has its roots in a research project that one of the case’s lawyers, Austin Smith, began when he himself was in law school, in 2014, at the University of Maine. Indeed, Mr. Smith has been digging into the subject ever since then. He started with an article in the American Bankruptcy Institute newsletter. Then, in March 2016, he argued his interpretation of how the Bankruptcy Code applied to private student loans in a lawsuit—and won it. Since then, he’s won nine more cases in New York, Texas, Minnesota, California and Connecticut, before joining late last year with other firms in New York, Chicago, Texas and Louisiana to bring Crocker et al. v. Navient Solutions, LLC, et al. In this case, Mr. Smith says, Navient itself has actually helped frame up the argument against it, by making one claim about the Bankruptcy Code to student borrowers, and an entirely different claim about it to the company’s own investors. 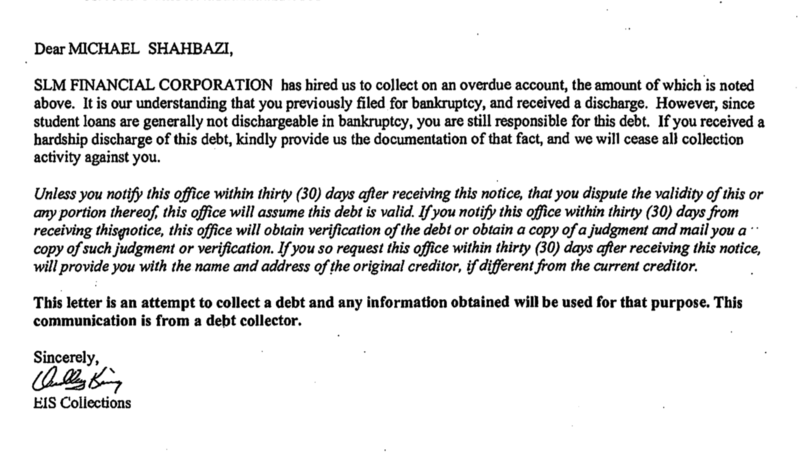 For example, collectors for Navient advised both Evan Crocker and his co-plaintiff Michael Shahbazi that their career training loans were “not dischargeable in bankruptcy.” But in a 2014 offering memorandum, Navient advised potential investors that career training loans “are generally dischargeable by a borrower in bankruptcy,” and so could put investors at risk of a loss. Mr. Crocker is now the lead plaintiff in the putative nationwide class action lawsuit that Mr. Smith, Ms. Swanson, and their co-counsel have filed against Navient. In March, plaintiffs in the Crocker case got some good news when, in response to their filings, Navient agreed to cease contacting potential plaintiffs in the case about their loan repayments, except by sending them monthly statements. As a result, Jones Swanson and co-counsel estimate that about 16,000 student debtors have stopped receiving what many describe as constant, harassing phone calls from Navient. Navient has also agreed in court to provide plaintiffs’ counsel with a list of names and contact information for Navient debtors with private loans who have declared bankruptcy since October 2005. But according to attorney Lynn Swanson, Navient hasn’t exactly delivered on that part of the agreement.